I was visiting an old friend of mine one afternoon, Barbara Faison, when I noticed a flyer on her refrigerator announcing Randy Walker’s run for a seat on the school board, district #4. “Who is that?” I asked, pointing to the flyer. (Did I mention she’s in her 70’s and bossy?) I do enjoy Barbara. We’ve been friends since my first child was still an infant. That being said, without waiting for a response, she picked up her cell phone, dialed Randy’s number and then handed the phone to me. After explaining to Randy why I was speaking with him instead of his aunt, I told him what I did and why I was calling. He kindly agreed to meet me for lunch at Aunny’s on Front Street. “Okay. I’m 57 and my wife and I of 21 years have three children,” he began with an easy smile. 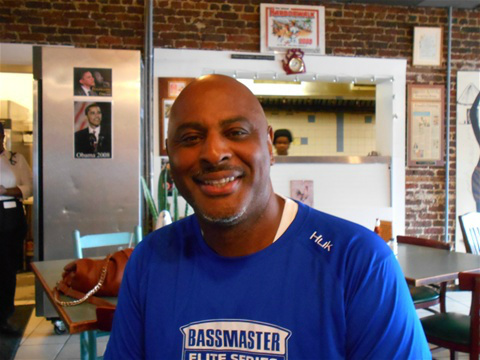 “I grew up in downtown Georgetown, over on Meeting Street and just down the street from Aunny’s owners, Charles and Andrea Johnson; we were neighbors growing up. “Now-a-days, people are so afraid to discipline their own child let alone someone else doing it, too,” Jane confirmed as she walked off to help a customer. “I’m an athletic coordinator for the Georgetown Rec Center. I’ve been working for and with youth sports since 1985,” he answered. I noticed Randy is quite a large man. I had no doubt he was athletic so I asked how tall he was. He said he was six-five. I think he is taller than that, but I didn’t bring my tape measure with me and I wasn’t about to dispute that with him, either. Randy leaned back in his chair and said, “His name was Lambert Reed. He taught us three important things that we had to live by: First, be where you’re supposed to be. Second, be there when you’re supposed to be there and third, accomplish what needs to be done. A thought occurred to me with current events. It’s been in the news lately about football being a dangerous sport so, I asked Randy about it. “Do you think it’s a good thing for children to play in sports?” I asked to start the conversation. I agree. Randy seems quite happy with his work. One can see he’s very passionate about it. His face lights up when he talks about the children and teaching them how to play out on a field. “So you would say that is your greatest accomplishment then?” I asked. We had talked about many things before, during and after lunch, but I found his take on children and sports to be a refreshing, yet, heartfelt point of view. As I said, Randy is very passionate about children and their education. Good luck in the upcoming election, Randy. Win or lose, we hope you continue doing such good work with Georgetown’s smallest residents.